When considering what site to play on, there are a lot of factors that come into play, such as cash out times, rake rates and other preferences, but something that isn’t compared as often is first deposit bonuses. Generally, when we see these offers, we only think of new players, but established winners can take advantage of these bonuses if they are moving to a new site as well. Most sites have their own versions of a first deposit bonus with some being much more lucrative than others. We will take an in-depth look at each US-facing poker site’s initial poker deposit bonus, the clearance rates of said poker bonus, other rules and conditions which may apply to it, as well as deposit options available so that poker players may redeem the FDB. Please note, all of the following sites are friendly to and allow US players from most states to participate in their games. If you are unsure whether your state is allowed, please check our guide to gambling and online poker USA for more information. Each bonus and site offers something a little bit different, and thus, each site might fit players’ needs a bit differently. For this reason we will not be saying which offer is better unless something is significantly below or above market averages. If you want to have a personalized consultation to help determine the best option for your situation, then you can use the “contact us” link to talk to us directly and answer any questions you may have. Once you have found one or more poker sites that interest you, simply scroll to the bottom of this page to find instructions on how to sign up and claim the first poker deposit bonuses that interest you. Ignition Poker, which calls the PaiWangLuo Network home, opened its poker room for business in 2016 and has since become one of the most popular rooms for Americans. One reason for this probably lies in the anonymous tables at Ignition Poker, which mask the identity of every player so that bum-hunting and other predatory tactics become impossible. It also has the largest traffic numbers of any U.S. site, which tends to have a snowball effect and keeps the tables well populated. Of course, the 100% up to $1,000 welcome bonus is also responsible for attracting quite a few players to the virtual felt at Ignition. The first deposit bonus at Ignition Poker clears in variably-sized stages with different rates of return as you progress toward the goal of amassing the entire sum of free money. You’ll accrue poker points through your play at the tables, and when you reach certain point totals, chunks of your bonus will be released to your real money balance. If you play tournaments, then the first section of the bonus is equivalent to 100% rakeback, but as you work through the latter stages of the bonus, this number will drop. Overall, the maximum possible bonus of $1,000 is worth 30% back of your tournament and SNG fees but slightly less at the cash tables. You have 30 days to work on the bonus before it expires. You have two options when it comes to making a deposit at Ignition: credit/gift cards and Bitcoin. The first deposit with a credit card is fee-free. However, your subsequent card deposits will incur fees. Bitcoin, on the other hand, is always free to use. Moreover, Bitcoin has a higher maximum permitted transaction size ($5,000) than credit cards ($1,500). Ignition explicitly states that any deposits you make within 24 hours after your first will add up and combine for the purposes of calculating your welcome bonus amount, so you can fund your account multiple times within a day if you can’t deposit the whole amount all at once. Bovada is on the same PaiWangLuo Network as Ignition, and all the tables and poker games are identical. However, the bonus size at Bovada.lv is only half that of Ignition. Your first deposit will be matched 100% up to $500. Compensating for this is the fact that Bovada has a sportsbook, which Ignition lacks. You can place wagers on football, basketball, baseball, and tons of other sports if you're interested in sportsbetting in addition to poker. This bonus uses a tiered structure whereby you'll release portions of your bonus cash when you achieve specified numbers of poker points. The bonus actually delivers a higher rate of return in the earlier segments. For instance, the first level of the bonus requires you to pay $5 in tournament fees to unlock a $5 piece of your bonus, for effective rakeback of 100%. If you're able to work through the entire $500 bonus, then you'll be compensated to the tune of about 30% rakeback in MTTs and sit-n-goes although this value drops slightly if you instead play ring games to earn the bonus. All uncollected bonus pieces expire after 30 days. The two deposit methods supported at Bovada are credit card and Bitcoin. Credit card transactions are permitted in the range of $20 - $1,500, and while your first deposit will be processed for free, further deposits via CC will be levied a 5.9% fee. To avoid such fees, we recommend using Bitcoin, which Bovada never adds extra charges to. Furthermore, you can deposit for a wider range of values with BTC: $10 - $5,000. Bovada specifically states that your bonus amount will depend on the total amount deposited within a day after your initial deposit, so you can make multiple deposits in the event that you can't fund your account for as much as you wish with a single one. Chico Poker Network, with leading skins BetOnline and Sportsbetting, is one of the hottest rooms in poker right now, and so you may still have this awesome deposit bonus to look forward to. Chico Network offers a 100% matching bonus up to $1,000. Players will have 30 days to clear this bonus, and the minimum deposit is $50. Clearance rates for the Chico Network welcome bonuses have, in the past, been governed by a complicated set of rules that delivered portions of the bonus at different rates as the player progressed toward unlocking the total sum. This has been done away with, and you’ll now steadily realize an effective rakeback percentage of 20% while the bonus is active. The bonus will be issued to your account in $10 pieces as you achieve the necessary amount of play. Getting money onto Chico Network is something that is quite easy, especially compared to some online sites. Players can use a plethora of credit cards (VISA, MasterCard, JCB or Diner’s Club) to deposit between $50 - $1,000, and money transfers for between $100 and $600. Chico Network also now has Bitcoin (BTC) available for player to deposit and withdraw. The limits are $20 and $25,000, but remember that you must deposit a minimum of $50 to be eligible for the first time poker bonus. Other crypto coins that have made an appearance at CPN are Bitcoin Cash, Litecoin, Ethereum, and Dash. Players can also deposit via book to book, cashier’s check, wire transfer or money order, but you will have to contact live support to figure out the specifics of what will be available to you and the amounts currently allowed. At Chico Network you are not allowed to initiate a withdrawal while clearing a bonus in poker, sports or casino. If your desired deposit method doesn’t allow you to deposit enough in one instance to maximize the initial deposit bonus, then we encourage you to talk to support BEFORE you deposit, and they will likely allow you to combine multiple deposits to take advantage of the full bonus. Winning Poker Network, which consists of America’s Cardroom, Black Chip Poker, PokerHost, True Poker and Ya Poker, has a fairly standard bonus of 100% up to $1,000 for players making their first deposit to the online card room. This bonus clears at a 20% rate, which is measured by Award Points given to players after each hand. You must get 27.5 Award Points per $1 of bonus you want released, but the bonus does release in $1 increments on most network skins, which is lower than at most sites. PokerHost does things a bit different: It releases the bonus in $5 portions, and it’s also the only of these WPN poker rooms that requires you to deposit a minimum of $20 to activate your bonus. You will have 60 days to earn as much of your bonus as you can. Americas Cardroom, and Americas Cardroom alone, adds an extra perk on top of the normal bonus described above. Any new depositing player will receive $50 in cash credits in addition to the aforementioned deposit bonus. This money will be paid out over a period of 20 days in a random amount of $1 - $6 per ticket. Players will need to log into their accounts each day to collect their tickets. Winning Poker Network has two types of reward systems available to players. The best program to sign up for in order to clear your initial deposit bonus (and subsequent reload bonuses) is the “Elite Benefits” VIP program. Anyone who has played on PokerStars in the last half a decade will be very familiar with this program as it is a virtual clone of the supremely popular PokerStars VIP system Under this program, your bonuses will clear with the full clearance rate, which is equivalent to an additional 20% effective rakeback! The elite Benefits program also allows high-volume players to earn up to 65% rewards their first year and up to 70% in subsequent years! There is also a flat rakeback program available with 27% rewards, but all bonuses will be reduced by 27% as bonuses are deduced from rakeback. The first deposit bonus can be claimed by using any of the available deposit methods that players have access to. Players should deposit as much as they are able to take full advantage of the bonus amounts. To make said deposit, players can use Visa or MasterCard ($25-$550), Bitcoin ($50-$25,000) – a preferred method for speed, ease and lack of need to answer question from your credit card company – Ria ($50-$700), or MoneyGram ($50-$500). Furthermore, there are dozens of crypto-currencies supported in cash you wish to use one other than BTC. If your desired deposit method doesn’t allow you to deposit enough in one instance to maximize the initial deposit bonus, then we encourage you to talk to support BEFORE you deposit, and they will likely allow you to combine multiple deposits to take advantage of the full bonus. Horizon Network, which hosts Intertops Poker and Juicy Stakes poker, offers a 200% up to $1,000 bonus and 90 days in which to clear it. You’ll be credited with $5 every time you amass 83.335 FPPs, which works out to perhaps 27% rakeback on top of the standard 36% rakeback offered by the network. Those who opt to join the VIP program rather than claiming rakeback, though, will see their rates of FPP accrual double, for clearance rates that may exceed 50% rakeback. While the terms of this bonus offer seem fairly generous, the lackluster traffic on Horizon Network could make it less appealing to some players. With that being said though, players playing below 200nl do have enough options to clear the bonus while grinding fairly soft games. Needing to take a hit to your hourly is not a forgone conclusion as there are a lot of perks that make this a fairly profitable option. There is a rake race (which is fairly easy to place in), benefits program and other bonuses that help supplement players’ win rates in a less variance-intense fashion than just playing at the tables. Getting money onto Intertops is easy and varied, so players should have absolutely no problem finding a funding method that works for them. You can use a credit card to put between $25 and $1,000 on to the site. Person-to-person cash transfers can be used for transactions in the $100-$490 range. A different option for players is to use a bank wire to fund their account. Ever since Intertops added Bitcoin deposits up to $1,000 per transaction, it has been a lot more convenient for American players to add money to their accounts. If your desired deposit method doesn’t allow you to deposit enough in one instance to maximize the initial deposit bonus, then we encourage you to talk to support BEFORE you deposit, and they will likely allow you to combine multiple deposits to take advantage of the full bonus. Credit cards are accepted at Grand Poker for values between $50 and $500. This poker room also accepts person-to-person deposits via processors it refers to as “P2P Red” ($100 - $690) and “P2P Orange” ($100 - $750). The best option for most players will be Bitcoin, which is supported for funding your account to the tune of between $25 and $10,000. Money order is another method of putting cash into your account, but details on how it works are a bit thin on Grand Poker’s website. If your desired deposit method doesn’t allow you to deposit enough in one instance to maximize the initial deposit bonus, then we encourage you to talk to support BEFORE you deposit, and they will likely allow you to combine multiple deposits to take advantage of the full bonus. This Bitcoin-only poker site was the first of its kind when it launched under its old name, Seals With Clubs, more than five years ago. 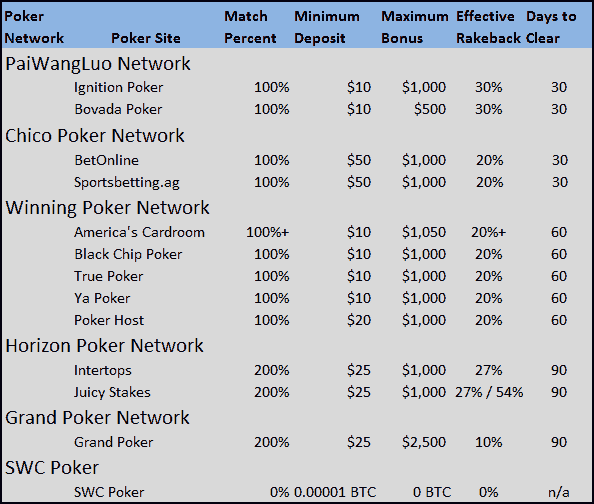 Since that time, many of the larger US-facing sites have adopted Bitcoin for deposits and withdrawals; however, SWCPoker remains the most notable site in which all games are denominated and played in BTC. SWC also has the most available game types of any poker site open to Americans. The down side to playing on this network is that they offer no first deposit bonus and have limited traffic. However, the traffic they do have is very soft. Bitcoin-only sites attract an entirely different type of player than most poker sites, and this is a great place to hunt for an occasional whale or to enjoy playing more obscure online poker games, like 12 game mix, badeucy, open face Chinese pineapple, and much more. You can read more in our SWCPoker review. Was the above too much to digest? TLDR? Well fear not, here is a nice and neat chart detailing the first deposit bonuses for each poker network as well as each individual online site for you to look over. Once you've decided which room is for you, don't forget to click the appropriate sign up link below. Players have a lot of different options in terms of what bonus they want to take, and there are a lot of things to consider before making your decision. It’s best to think about how much time you will have to spend playing, the amount of money you have to deposit and the methods that you have to deposit that money with. Keep checking our home page for updates on specific sites’ promotions for a given month as we try to bring you all the added-value promotions at the beginning of each month! Before signing up for any of the great sites we’ve talked about, it is important to clear your cookies (browsing history) to ensure that you are eligible for the stated bonuses in this article. Below, we have compiled instructions for clearing cookies from the most popular internet browsers, including mobile browsers. Once you have completed the process, you can then find your desired site on the table below and you will be able to sign up for the maximum initial deposit bonus available!